So I lay in a dark box full of water…and it was awesome. 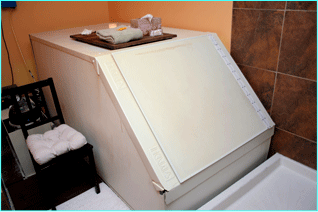 A few weeks ago my friend Jeanne told my husband to tell me to remind her about this sensory deprivation box thing. I don’t take such intriguing enigmatic statements lightly, so I followed up. She had heard from a friend about these tanks you can lie in as a relaxation technique. They hold 10 inches of water warmed to the average skin temperature and they are saturated with 800 pounds of Epsom salts. The salt increases the buoyancy of the water, giving the user hyper-floating abilities akin to what you get with the Dead Sea. The user gets inside and closes the door, sealing out all light, and lies down. So, if you were me, would you float in a dark coffin full of water for an hour and pay for it? Of course you would. So we scheduled an appointment. I arrived in the questionable-looking parking lot just before the appointment began. I questioned whether my car was safe…not so much from thugs, but rather from the City of Chicago (another friend’s car was recently booted and towed…getting it back turned into an adventurous foray into windy city political bureaucracy and corruption…a story for another day). I didn’t want to be late so I left my car under the El tracks and hoped for the best. I went through a door that was curiously labeled “MALL” into a squat, dimly lit hallway with beams cutting across it diagonally, making passers-through duck to get by. What, I thought, did we get ourselves into? I saw Jeanne ahead beckoning me forward. I passed through another door into a room that was painted purple, flickered with candlelight, and smelled of incense. I hung up my coat and looked around. One of the walls was taken up by an enormous fish tank full of lovely tropical fish. To keep them company in there I noticed someone had decorated the aquarium with many statues of Buddha and Buddha heads. 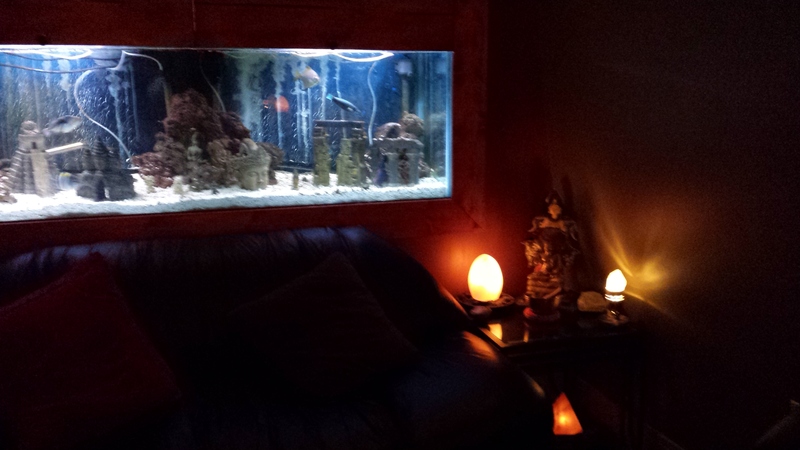 Buddha also took up residence above the tank, on the side tables, and on the bookshelves. Jeanne pulled a book off the counter called “Floatation Diary.” Inside people had written little notes about their experiences in the tank. The content ranged from, “Oh, I feel so relaxed now!” to “I saw God today.” Fair enough. People had also drawn pictures. There were a lot of rainbows for some reason. A few minutes later the receptionist came back into the lobby. I have never seen anyone look quite like she did. I was immediately struck by her mane of feathered, shockingly purple hair. Her ears were full of silver hoops and she wore so much eyeliner on her eyes and eyebrows that she looked like a pale, Egyptian painting. She sported a flowy black skirt with a jagged hem. I noticed she had tattoos wrapped around both wrists. “Are you Emily?” she asked in a perky voice. I managed to nod. She took us back to the rooms with the tanks. Each room was private with one large tank, a shower, a candle, and a chair. The tank was about 4 feet by 10 feet with a big door on a hinge facing the shower. She explained to us the process and gave us a chance to answer questions. Then she showed Jeanne to her own room, and I found myself alone with my tank. I got into my bathing suit and rinsed off. I cautiously stepped through the door into the tank. The water felt silky with all the salt. I kept the door open at first as I got by bearings inside the tank. Having been so fortunate as to have swam in the Dead Sea before (What a great Christmas Day! ), I knew that the experience of floating in super salinated water is unlike any other. You pop right up to the surface as if a million tiny hands were pushing on your bum…and there’s not much you can do about it. You just bob there like a doofy duck. In this tank, however, the idea was to be still. I lay back and floated effortlessly. I felt my hair spread out around my head. It was not hard to relax. I closed my eyes, but the light from the room distracted me, so despite some minor concerns about claustrophobia, I closed the door. The darkness was immediate and lasting. As my eyes adjusted, I could only make out a tiny sliver of light coming between the door’s seams. But I embraced the darkness as it made it so much easier to close my eyes and begin to meditate on the sensations of floating. An hour never passed so quickly in my life. I’m not even quite sure what I thought about while I was in there. It was more like flashes of thought. I tried to meditate, I tried to pray, I tried to figure out how to focus on relaxing the places in my body where I most often carry tension. I tried to balance in the water so that I wouldn’t touch any of the walls. The few times I achieved this I found myself able to relax more deeply, and I could have stayed like that for quite some time. But before I knew it, I heard a gentle knock on my tank signalling that my hour was over. Overall, the experience was fascinating and totally worth it. I wouldn’t say, however, that I felt any lasting effects from my time in the tank, but Jeanne and I agreed, upon sharing our experiences, that if we did it again, knowing what to expect, we might be able to get more out of it. I also wondered, however, if I would ever be able to feel completely relaxed while floating. There is a part of me that doubts whether I can really just let go. I pondered the spiritual ramifications of this, wondering where else in my life did God just want me to let go and trust that his invisible hands would support me. For the most part, I am not that enamored of more “new age-y” medicinal solutions, but there is definitely something to be said for a holistic approach to our bodies’ ailments, as well as a lot to be said for finding ways to rest our bodies. We do things every day our bodies weren’t meant to do, including sitting at desks or in cars for hours on end, or looking at screens all day, or stressing ourselves out about our self-inflicted busyness. We forget the critical need to rest our minds and our bodies. Whodathunk that floating in a dark tank would be a solution.